During my first visit to Stirling Castle (18 months ago) I was disappointed to find a large section closed off for renovations. The Royal Apartments were being done up to look like they would have during the time of Mary of Guise, widow of James V and mother of Mary Queen of Scots. 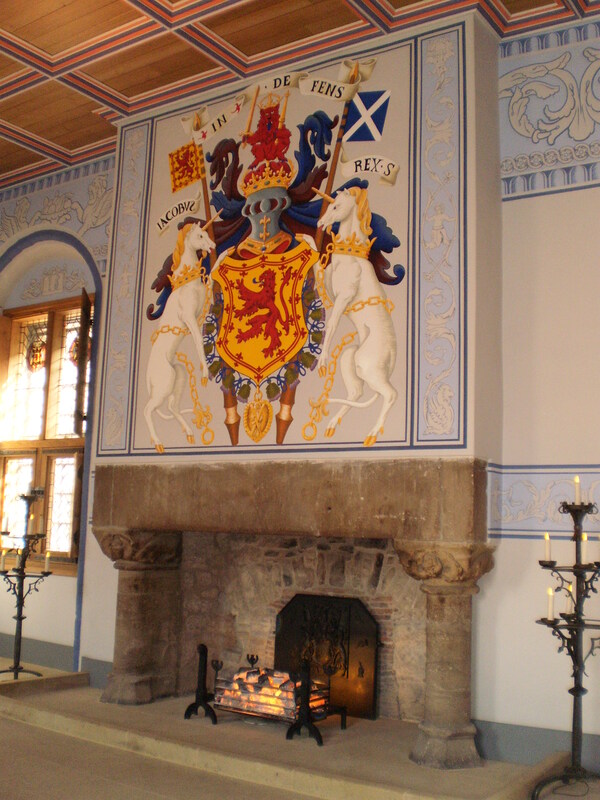 Stirling was the seat of power for several Stuart Kings, and since her husband James V died before they would have been completed, Mary of Guise ruled from these apartments as regent. Stirling was one the most strategically important castles of the time, and has great natural defenses. The entire old town sits atop an extinct volcano overlooking the River Forth and the primary route from the Highlands to the lowlands passed through the town. The castle changed hands several times during the war of independence and Robert the Bruce’s eventual victory at the Battle of Bannockburn took place nearby. However, most of the current buildings are from the 15th and 16th centuries as Stirling increased in its importance as a royal residence. James V wanted his palace to be grand, and impress any other European ruler coming through its gates, particularly his new bride Mary of Guise. In a lot of ways, there is far more to see at Stirling’s castle than there is at Edinburgh Castle. There is the Great Hall, the Royal Apartments, the kitchens, the regimental museum, the tapestry studio, and Argyll’s Lodging just a short walk away. Plus, in the hour and change before Aarti’s train got there I got to walk around a bit, and I made it over to the heading hill where the beheading stone sits. I really liked the short walk around Argyll’s lodging. The tour guide seemed really knowledgeable and enthusiastic about the evolution of the house and how each of the owners put their touches on it. We even bought a bottle of nice local Drumgray whisky liqueur from the castle shop, which Aarti and I opened tonight. Even though there are some similarities, it tastes very different than bailey’s. Drumgray uses a single malt whisky and a scottish double cream.